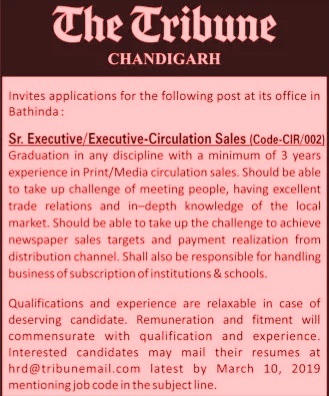 The Tribune Chandigarh Recruitment 2019 News: Check The Tribune Recruitment 2019 online as in this portal we will give all latest job notices issued by the tribune newspaper in coming months (only after official announcement..), till you may view previous circulars. The Tribune Newspaper issues job notice for Executive/ Senior Executive Posts. Interested candidates have to apply on or before 10 March 2019. 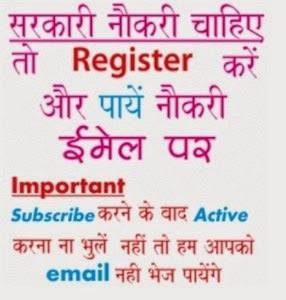 Further information of The Tribune Recruitment 2019 regarding salary, qualification/ experience and how to apply etc is mentioned below………….. The Tribune Trust publishing the widely circulated and read newspapers – The Tribune, Dainik Tribune and Punjabi Tribune. Its flagship brand, The Tribune is widely published Newspaper. It is no. 1 English paper in States of Punjab, Haryana, Chandigarh, Uttarakhand, J & K.
Interested jobs hunters have to submit recent resume at hrd@tribunemail.com mentioning the post applied for in the subject column.